State of the Amazon: Freshwater Connectivity and Ecosystem Health report is launched during the 7th World Water Forum, Gyeongju, Korea. The freshwater ecosystems in the Amazon region are under threat by deforestation and especially by connectivity interruption. More than 250 new hydropower dams are planned for the region. If all go forward as planned, only three free-flowing tributaries of the Amazon River will remain, compromising the river network and the provision of ecosystem services to the societies and economies in the region, to the countries of South America and to the world. The Amazon is one of the most important natural regions on Earth usually known for its forests and the immense volume of deforestation each year. But the Amazon is also the largest river system in the world with more than 100.000 km of rivers and streams. The report provides a comprehensive assessment of the current state of Amazon freshwater ecosystems and highlights the importance of hydrological connectivity and land-water interactions in maintaining the ecological functions that support water, food and energy security. It also evaluates public policies, stressing the importance of Pan-Amazon planning for maintaining Amazon ecological stability. A panel of experts will be moderated by Yolanda Kakabadse, president of the Board of WWF International. Leandro Castello will present the main findings of the report. He is conservation biologist, assistant professor at the Virginia Polytechnic Institute and State University (USA) and shares the authorship of the scientific assessment with ecosystem ecologist Marcia Macedo, assistant scientist at the Woods Hole Research Center (WHRC). Flavia Loures, researcher at China International Water Law (CIWL), Xiamen University (China), will discuss the international legal framework to protect Amazon freshwater ecosystems. WWF integrated approaches for a greener hydropower development in the Pan-Amazon and concrete case studies will be presented by Cláudio C. Maretti, WWF Living Amazon Initiative leader. “Electricity might be important for the sustainable development of the region. Hydropower is not a clean energy, but it is better than fossil fuels and nuclear. Nevertheless, the hydropower planning and development need to consider integrated approaches to be viable in the Amazon. WWF’s main goal is to promote a debate with key stakeholders in order to discuss the need for a regional, Pan-Amazon integrated approach on hydropower generation planning, while ensuring the ecosystems integrity, avoiding their fragmentation, and maintaining the Amazon ecological services, as well as safeguarding the rights of indigenous populations and local communities”, explains Cláudio Maretti, WWF Living Amazon Initiative leader. The threats to the connectivity of Amazon freshwater ecosystems operate across multiple scales, as do efforts to curb their impacts and conserve freshwater resources. The Tapajós River Basin will be presented as a concrete example of methodologies and tools to evaluate the cumulative ecological and social impact of dams and associated infrastructure on a whole river basin. The Tapajós river basin is Located in the deforestation arc of the Brazilian Amazon and covers just under 500,000km2 of area in the Brazilian states of Mato Grosso, Pará, Amazonas and a small portion of Rondônia. 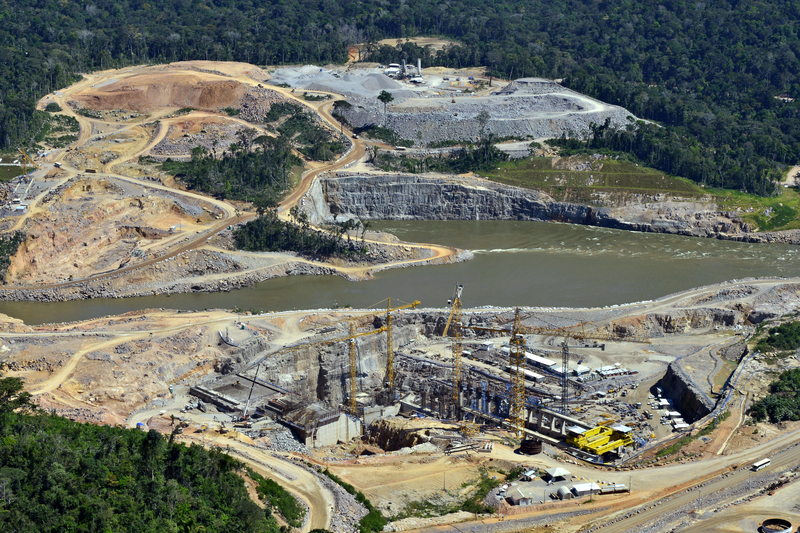 In total, 44 medium- to large-size hydroelectric power plants were assessed on the Tapajós, Jamanxim, Juruena and Teles Pires rivers and their tributaries, eight of which are slated to come into operation by 2023. Most of the planned or assessed plants affect protected areas or indigenous territories in some way, either by flooding ecosystems within protected areas or by modifying river flow due to the building of dams upstream from protected areas. Biodiversity: The Amazon region is number 1 in biodiversity on Earth, with one new species presented to science every 3 days in the last 14 years - not counting insects and microorganisms. And there is much yet is to be discovered. Freshwater biodiversity: Freshwater connectivity is particularly critical for fisheries and regional food security, since many economically and ecologically important fish species depend on lateral or longitudinal migrations for parts of their life cycles. Long-distance migratory catfish, for example, travel thousands of kilometres from the Amazon’s estuary to the headwaters of white-water rivers, where they spawn in the Andean foothills. Amazon Watershed: The Amazon watershed spans 6.9 million km2, connecting nine countries in South America - Brazil, Bolivia, Peru, Ecuador, Colombia, Venezuela, Guyana, Suriname and French Guiana/ France. The hydrological connections help maintain over 1 million km2 of freshwater ecosystems, which sustain a wealth of biological diversity and productive fisheries that are a vital source of protein and income for Amazonians. The Amazon River network is the lifeblood of the regional economy. The Amazon River: The Amazon River itself is the largest in the world in water volume and flows through 6,992 Km. At its mouth, the Amazon discharges about 6,700km3 yr-1 of freshwater into the Atlantic Ocean, about 20 per cent of global surface river flows. Deforestation: almost 20 per cent of the Amazon Biome – 6,5 million km2, has already been deforested. 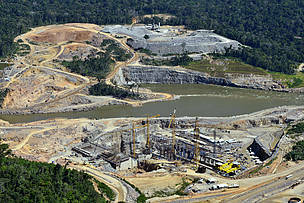 Dam construction is interrupting the free-flowing of Teles Pires River, Tapajós Basin, Brazil.